Five game days in the last four weeks before the internationals and Easter break: it’s been a busy schedule for all the Ekstraklasa players and all football fans. Krakow Ekstraklasa teams suffered fates as varied as the early spring weather, from easy wins to embarrassing flops. In the end, the figures are clear for both sides: Cracovia and Wisła are still struggling to make their way in 2016. It’s a fact now: the ‘Pasy‘ (the Stripes, Cracovia’s team nickname) are unable to reproduce what they’d been showing before the winter break. They haven’t reached their level of efficiency. And after holding the impressive record of being undefeated at home since September 2015, they lost their last 2 home games against Zagłębie Lubin (1-2) and recently against the league leaders Legia Warszawa (1-2). In between their home games, the Stripes managed a great away win against Ruch. Playing in Chorzów is always a complicated trip: hostile environment; small and old stadium; boiling fans. Cracovia showed attitude and efficiency to come back from 2-1 down to 3-2, securing a precious win. However, they didn’t manage to confirm the good result and lost their next game, away, against last season Polish Champion Lech Poznań (2-1). Three defeats in the last four games, and only two wins in 2016 (in six games). Losing their top scorer Deniss Rakels in January (transferred to Reading in English Div. 2) was a big loss, and it’s probably impacting the balance of the team. Adding that they’ve been conceding at least one goal in each game, the issue is not only offensive but also defensive. But on a positive note, their Slovakian striker Erik Jendrišek is currently in top form with four goals scored in the last 6 games. After their strong first round, the most difficult part for Cracovia is now to confirm. But with a limited budget and squad, the team was not initially built to fight for the league title. And this is reflected now, as they reach their limit in terms of physical shape and exhaustion due to the lack of player turnover. And their last game against Legia Warsaw was also a good test against a title candidate. But despite good actions and moments from Cracovia, Legia’s experience made the difference. The richest club in Poland is built to play the European League and fight for the Champion title every season. A lesson of realism and efficiency. Light at the end of Wisła’s tunnel? Still stuck in a negative spiral, the White Star (Wisła’s team nickname) have 11 league games without a win behind them. Even if recently they managed to secure a few points (two draws in their last two games) and showed some encouraging signs, there are still so many things to improve. On February 27th, they offered a disappointing home defeat against Podbeskidzie to their faithfull fans, despite leading 1-0. Then, they welcomed a much tougher candidate a week later: Piast Gliwice. 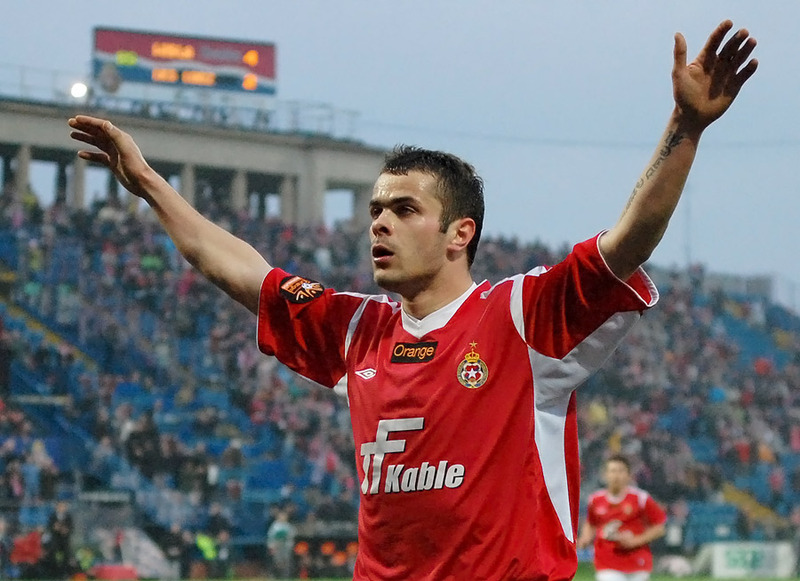 The team, coached by ex-Schalke 04 player Radoslav Látal, surprised the entire Polish Ekstraklasa Planet by ending up the first round at the first spot. Wisła managed a strong game, but ended up once again without a win. The key event was a last minute penalty following a doubtful referee decision. A blessing for the White Star and a golden opportunity to finally stop the negative streak and offer their fans the win they deserve. But fate played against them, and Wisła’s top scorer Paweł Brożek missed. There couldn’t be a worst scenario than that. A few days later away at Korona Kielce, Wisła controlled the first half but scoring only 1 despite the many chances they created. They paid this lack of efficiency back after the break. They disappeared in the second half, invisible and unable to stop Korona from equalizing. Once again, Wisła couldn’t keep consistency, but this time they can be happy not to have lost that one. They traveled to Nieciecza for the last game of the 27th game day. And finally, their unfruitful series came to an end. The teams spoiled the fans with 6 goals in 55 minutes, offensive play from both sides and a win – at last – for Wisła! 2-4 was the final score, although the luck was for once on their side, as Nieciecza hit the post twice. After breaking their streak of 11 league games without a win, Wisła then broke another negative one the following weekend, probably the most symbolic: they booked their first home win since August (nine home games in a row). The White Star beat Jagiellonia Białystok in style with 5-1, but the Gods of Football were this time on Wisła’s side: Jagiellonia’s defender Tarasovs got red carded after only eight min, which made Wisła players’ life so easy. And from the five scorers, Paweł Brożek symbolically scored two goals, putting an end to the recent criticism against him. Four games without losing, two wins in a row, and nine goals scored in the last two games, Wisła seem to have finally healed and is getting further away from the relegation zone. They are still conceding too many goals, but at this stage gaining points is certainly the most important thing. Wisła made a huge step out of the red zone and can look up again. With 2 games left, they still have a chance to qualify for the Playoffs but would have to win their remaining games and hope for their opponents in the table to drop points. They are currently 12th with 32 pts, 8 pts clear from Górnik Zabrze the bottom team. At the top-end of the League Table, Cracovia is 3rd with 44 pts closely followed by Pogoń Szczecin (44 pts) and Lech Poznań (41 pts). Wisła will visit Ruch Chorzów next Sunday April the 3rd, before welcoming Zagłębie Lubin on Saturday, April the 9th. Cracovia will welcome Górnik Łęczna on Saturday April, the 2nd before traveling to Śląsk Wrocław for the final game of the regular season.